For other uses, see Alpha and Omega (disambiguation). Alpha (Α or α) and omega (Ω or ω) are the first and last letters of the Greek alphabet, and a title of Christ and God in the Book of Revelation. This pair of letters are used as Christian symbols, and are often combined with the Cross, Chi-rho, or other Christian symbols. The term Alpha and Omega comes from the phrase "I am Alpha and Omega" (Koiné Greek: "ἐγὼ τὸ Α καὶ τὸ Ω"), an appellation of Jesus in the Book of Revelation (verses 1:8, 21:6, and 22:13). The first part of this phrase ("I am the Alpha and Omega") is first found in Chapter 1 verse 8 ("1v8"), and is found in every manuscript of Revelation that has 1v8. Several later manuscripts repeat "I am the Alpha and Omega" in 1v11 too, but do not receive support here from most of the oldest manuscripts, including the Alexandrine, Sinaitic, and Codex Ephraemi Rescriptus. It is, therefore, omitted in some modern translations. Scholar Robert Young stated, with regard to "I am the Alpha and Omega" in 1v11, the "oldest [manuscripts] omit" it. A similar reference is in Isaiah 44, where the Lord says to be the first and the one who is after all. Alpha (Α) and omega (Ω) are the first and last letters, respectively, of the classical (Ionic) Greek alphabet. Thus, twice when the phrase "I am the alpha and the omega" appears it is further clarified with the additional phrase, "the beginning and the end" (Revelation 21:6, 22:13). The first and last letters of the Greek alphabet were used because the book of Revelation is in the New Testament, which was originally written in Greek. This phrase is interpreted by many Christians[according to whom?] to mean that Jesus has existed for all eternity or that God is eternal. Though many commentators and dictionaries ascribe the title "the alpha and the omega" to both God and to Christ, some secular sources argue otherwise. Barnes' Notes on the New Testament (1974) claims: "It cannot be absolutely certain that the writer meant to refer to the Lord Jesus specifically here ... There is no real incongruity in supposing, also, that the writer here meant to refer to God as such." Most Christian denominations also teach that the title applies to both Jesus and his Father. The letters Alpha and Omega in juxtaposition are often used as a Christian visual symbol (see examples). The symbols were used in early Christianity and appear in the Roman catacombs. The letters were shown hanging from the arms of the cross in Early Christian art, and some crux gemmata, jeweled crosses in precious metal, have formed letters hanging in this way, called pendilia; for example, in the Asturian coat of arms, which is based upon the Asturian Victory Cross. In fact, despite always being in Greek, the letters became more common in Western than Eastern Orthodox Christian art. 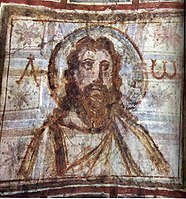 They are often shown to the left and right of Christ's head, sometimes within his halo, where they take the place of the Christogram used in Orthodox art. In Rabbinic literature, the word emet (אמת meaning "truth"), one of the names of God in Judaism, has been interpreted as consisting of the first, middle, and final letters of the Hebrew alphabet. The Qur'an gives al'Awwal (الأول), meaning "The First" and al'Akhir (الآخر), meaning "The Last" as two of the names of God: 57:3. ^ Gauding, Madonna (2009). The Signs and Symbols Bible: The Definitive Guide to Mysterious Markings. New York, NY: Sterling Pub. Co. p. 84. ISBN 9781402770043. ^ "The Book of Revelation". CCEL.org. . The words are used by Jesus according to the translation of J. B. Philipps, in which he places these words in red to indicate that it is Jesus speaking. ^ Young, Robert (1977). Young's Concise Commentary on the Holy Bible. p. 180. ^ Interlinear Greek English Septuagint Old Testament (LXX) (in Ancient Greek and English). p. 2432. Archived from the original on May 23, 2018. 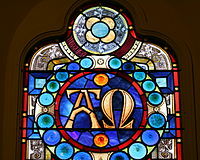 Wikimedia Commons has media related to Alpha Omega. Hassett, Maurice M. (1907). "A and Ω" . In Herbermann, Charles (ed.). Catholic Encyclopedia. 1. New York: Robert Appleton Company.